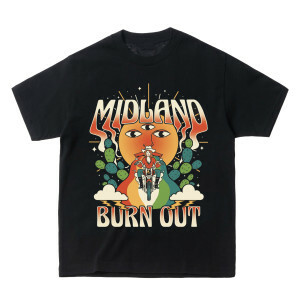 Soft style t-shirt with motorcycle sun graphic to celebrate the release of new single "Burn Out". The shirt arrived fast and it looks AMAZING - awesome design! I love the shirt fits well.And is so soft. Bought T-shirt for my daughter . She loves it . both of us are big Midland fans . this band is wonderful-- love their sound- they will go far! !